When you are feeling exhausted, have a cookie! You will feel relax. When you are feeling depress and down, have a cookie! You will feel better. When you are stuck and can’t make up your mind, have a cookie! You will find your way out. When you are starving and craving for a scrumptious food, have a cookie! You will be satisfied. So don’t wait and baked your own chocolate chips cookies today. 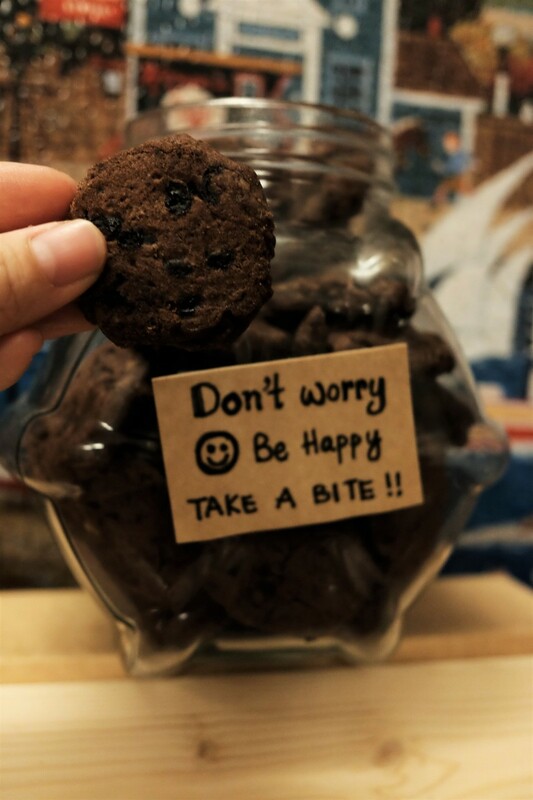 Nothing happier than having your cookie jar filled with double chocolate chips cookie! It’s really easy and yummy. 1. Preheat the oven at 190C. 2. Beat the sugar and butter until creamy, then beat in the vanilla extract and egg. Sieve the flour, cocoa powder and bicarbonate of soda over the mixture and mix well. Then add in the walnut and chocolate chips, stir well. 3. Make the mixture into balls, then press the balls on the baking tray. Bake in oven for 8-10min, and removed the cookie to cool completely.